This is an excerpt from Clinical Exercise Physiology, Third Edition edited by Jonathan Ehrman, Paul Gordon, Paul Visich, and Steven Keteyian. The American College of Sports Medicine’s Guidelines for Exercise Testing and Prescription recommends that an exercise program focus on physical activities and intentional exercise for 60 to 90 min/wk to promote and maintain weight loss (4). These recommendations are beyond the general recommendation of 1,000 to 2,000 kcal expenditure per week (30 min on most days) for general health benefits. Exercising for 250 to 300 min per week (or ~60 min per day) is equivalent to about 2,000 kcal energy expenditure per week. But this figure is less than the 2,500 to 2,800 kcal per week expenditure recommended by the National Weight Control Registry mentioned previously in this chapter (133). Therefore, the following exercise prescription recommendations are based on a weekly caloric expenditure of 2,000 to 2,800 kcal per week. This goal range is appropriate for all obese individuals, although some obesity class II patients and most class III patients will have to progress gradually to these higher levels of daily energy expenditure. Counseling about physical activity provided by a clinical exercise physiologist will help people develop realistic goals, establish appropriate exercise progression schedules, and gain control of their exercise programs (96). See table 7.8 for a summary of the exercise prescription for overweight and obese individuals. Initially, exercise and physical activity should focus on cardiovascular (i.e., aerobic) modes. The primary reason for this approach is to focus on the greatest amount of energy expenditure possible in a given period of time. To achieve the target of 2,000 to 2,800 kcal per week expenditure, exercise must be predominantly aerobic. Although resistance training may provide added benefits, the caloric expenditure of resistance training is less than that of aerobic exercise because (1) it is performed discontinuously, (2) a single training session incorporates less exercise time than an aerobic session does, and (3) resistance training should be performed on only 2 or 3 d/wk. Resistance training should be considered only after a regular aerobic program meeting the weekly caloric expenditure goal has been in place for a minimum of 1 mo. Exercise mode selection is important for enhancing adherence and reducing the risk of injury. Some people have preexisting musculoskeletal issues that could prevent certain modes of cardiovascular exercise. These issues often relate to pain in the lower back, hip, knee, and ankle joints that may be chronic. However, these problems may improve as weight is lost. The clinical exercise physiologist should assess any painful conditions and make recommendations to avoid this type of pain. In general, aerobic exercise should be categorized as either weight bearing or non-weight bearing. When possible, walking is the best form of exercise for several reasons. Walking has few disadvantages; all patients have experience with the activity and a goal to remain functional and independent. Walking is an excellent, low-intensity activity with little risk of injury. It is available to most patients and does not require special facilities. Neighborhoods, parks, walking trails, shopping malls, fitness centers, and so on offer walking opportunities. A minimum amount of attention is necessary, so socializing is easy and convenient. If a patient wishes to walk on a treadmill, care should be taken to assess the weight limits of the treadmill. Many are rated to handle only 350 lb (160 kg). Issues relate to the ability of the walking board and motor to handle the weight of an individual. If a motor seems to “bog down” when an individual is walking on it, then the weight of the person is likely too much. Treadmills especially designed for obese individuals up to 500 lb (227 kg) are available. Jogging should usually be avoided, especially in patients with no previous jogging history or people who have a preexisting musculoskeletal issue that may be aggravated by jogging. Some class I patients may be appropriate candidates for jogging. Non-weight-bearing exercise options include stationary cycling, recumbent cycling, seated stepping, upper body ergometry, seated aerobics, and water activities. These activities are useful at any time but are particularly useful for those with joint injury or pain. The clinical exercise physiologist should adapt these modes of exercise by providing larger seats and stable equipment. People who are obese often have difficulty getting on or off these types of equipment or moving through the range of motion required by a given piece of equipment. For some individuals, seated aerobics may be an excellent option to reduce the typical orthopedic limitations that some people experience, including back, hip, knee, and ankle pain. Another advantage is that seated or chair aerobics can be performed in the comfort of a person’s home. In extremely obese individuals, it is important to use a chair that is rated to handle a very heavy body weight. In some chair aerobic exercise routines, the force on the chair from the movement and body weight can be quite large. Water provides an alternative to walking or aerobic dance activities performed on land. The buoyancy of water takes much of the body weight off the joints. Additionally, patients who experience heat intolerance with other activities are often more comfortable performing water-based exercise. Most patients are not efficient swimmers, so swimming laps should be avoided. An experienced exercise leader can make a workout session fun and effective. For example, the resistance of the water can be used creatively to increase intensity. Many patients do not consider water activities because of the effort necessary to get into and out of the pool and because of their concern about their appearance in a bathing suit. The exercise physiologist should work to overcome these issues by using zero-entry pools and locations where the public does not have a direct view of the aquatic facility. Behavioral changes in activity must be consistent and long lasting if the patient is to lose weight and maintain weight loss over the long term. Daily exercise and physical activity at the recommended levels of duration and intensity are required to achieve and sustain long-term, significant weight loss. All people who are obese can exercise daily, typically from the beginning of a program. Key factors are to minimize the duration and intensity initially to avoid excessive fatigue or muscle soreness that may sabotage the patient’s willingness to exercise the next day. Altering the exercise mode may also help reduce the risk of injury. The intensity of exercise must be adjusted so that the patient can endure up to 1 h of activity each day. For those who have never exercised previously, intensity in the range of 50% to 60% of peak V. O2 (50-60% of heart rate reserve) is typically low enough for sustained exercise. However, an intensity closer to 40% may be required by some individuals, particularly those who have not exercised recently. As an individual progresses, a goal of 60% to 80% of heart rate reserve is adequate. People without significant comorbid conditions can perform at these intensities in either a supervised or a nonsupervised setting. Many individuals who are obese are hypertensive and may be taking a b-blocker. This possibility must be considered when intensity is prescribed using heart rate. Typical rating of perceived exertion values of 11 to 15 (6 to 20 scale) may be substituted when assessing heart rate is not convenient. For those with little or no previous recent exercise history, beginning with 20 to 30 min each day is appropriate. Breaking this exercise time into two or three sessions per day of shorter duration (5 to 15 min) may be required for highly deconditioned people. Progression of approximately 5 min every 1 to 2 wk, until the person can perform at least 60 min of exercise, is usually appropriate. This progression scheme is intended to increase compliance to the duration of each session as well as to daily exercise. An accumulation of time over several sessions in a day is as beneficial as one continuous work bout with respect to total caloric expenditure. Besides performing this intentional exercise duration, all obese people should be continuously encouraged to maximize daily physical activity by considering all options. For instance, they could park at the far end of the parking lot when visiting a store or get off one or two stops early when taking public transportation. The duration of daily physical activity should typically not be restricted unless the individual appears to be suffering from effects of excessive activity. But the contribution of incidental exercise to total caloric expenditure is significant and may be as beneficial as that of the planned exercise (6). Intensity and duration must be manipulated so that the intensity is low enough to allow suitable duration to expend the recommended caloric energy. For many obese patients, the intensity will not be great enough to improve cardiovascular fitness. The initial focus, however, should be on weight loss and therefore caloric expenditure. As the exercise progresses and the individual is able to better tolerate the exercise routine, higher-intensity activities should be encouraged. Patients should be encouraged to increase the duration from 20 min per day to 60 min or more per day on every day of the week so that they expend >2,000 kcal per week. An exercise program for obese patients should include both the supervised and nonsupervised phases with adaptations in modes, intensity, duration, and frequency to provide adequate calorie expenditure while preventing soreness and injury. 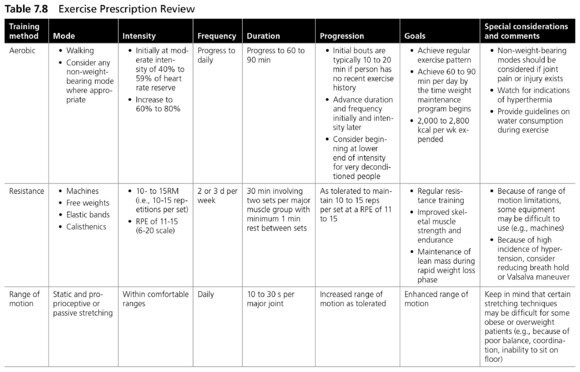 Patients with existing comorbidities should preferably participate in a supervised exercise program 3 to 5 d/wk with a prescribed intensity and duration to treat their comorbidities. Patients should be physically active a minimum of 60 min each day, including the days of supervised exercise; therefore, they may have to supplement with walking to accumulate 60 min. The remaining days of the week (2-4 d) can be nonsupervised with self-reported exercise to accumulate 60 min of physical activity each day. If resistance training is incorporated, careful attention must be given to beginning this type of program. Strength equipment may not be an option for some morbidly obese individuals. In general, the exercise prescription for obese people should include resistance intensity in the range of 60% to 80% of an individual’s one-repetition maximum (1RM,) performed for 8 to 15 repetitions for two sets each, with 2 to 3 min of rest after each bout. This plan will allow the person to perform 6 to 10 exercises in a 20 to 30 min session. Resistance exercises can be performed maximally on 2 or 3 d/wk. These exercises should focus on the major muscle groups of the chest, shoulders, upper and lower back, abdomen, hips, and legs. The primary acute benefit of the prescribed resistance program is to improve muscle endurance; the secondary benefit is to increase muscle strength. For obese individuals, the long-term benefit may be related to a higher resting metabolic rate (RMR) and protection of lean mass loss during rapid weight loss attempts. Practical application 7.2 provides guidance for interactions with those who are overweight or obese. Obese patients may have a reduced range of motion as a result of increased fat mass surrounding joints of the body (46), in conjunction with a lack of stretching. As a result, these patients often respond slowly to changes in body position and have poor balance. Persons who are obese are also at a greater risk of low back pain and joint-related osteoarthritis because of their condition (35, 121). Therefore, range of motion may improve spontaneously with weight loss (62). Still, to the degree possible, patients should perform a brief flexibility routine focused on the legs, lower back, and arm and chest regions. Normal flexibility routines (see chapter 5) are recommended as tolerated. Read more from Clinical Exercise Physiology, Third Edition by Jonathan Ehrman, Paul Gordon, Paul Visich, and Steven Keteyian.